The University of Florida College of Pharmacy maintained its top position in the national pharmacy residency rankings when 135 graduates and soon-to-be graduates matched with residency programs in 2019. It’s the fourth consecutive year UF has ranked No. 1 nationally in total graduates matching with American Society of Health-System Pharmacists, of ASHP, residency programs. 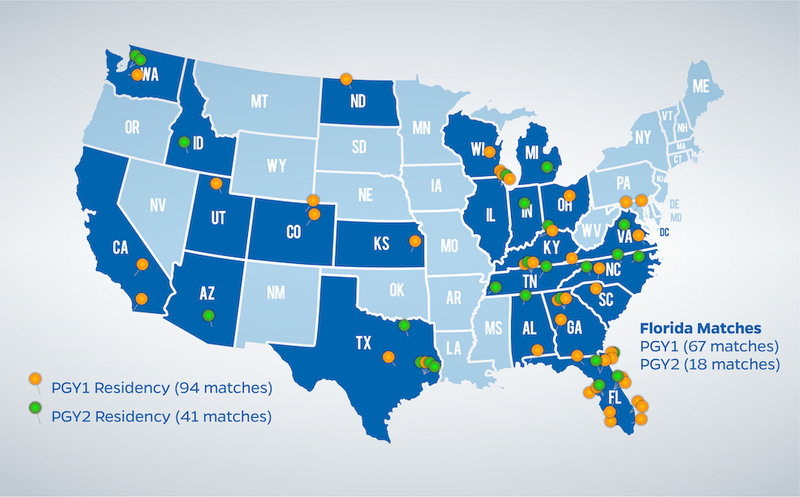 ASHP’s match program pairs thousands of student pharmacists across the country with hospitals and community pharmacies. More than 5,100 postgraduate year one, or PGY1, and postgraduate year two, or PGY2, residency positions were available this year. UF’s 135 residency matches included 94 fourth-year students matching PGY1 and 41 class of 2018 graduates matching PGY2. From Seattle to Miami, Gator pharmacists will advance their training in residency programs across the nation. UF College of Pharmacy fourth-year students and graduates matched with residencies in 22 states and Washington, D.C. The majority of graduates will continue their pharmacy careers in the state of Florida, with 85 matching in the Sunshine State.